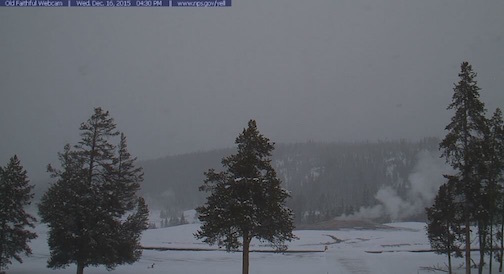 Starting today, December 15, 2015, three of Yellowstone’s entrances are open to over-snow vehicles, park officials announced. A fresh snowfall assured that the planned opening day can take effect, and snowcoaches and snowmobiles can enter through the West, South, and North Entrances. However, over-snow vehicles really take over at Mammoth Hot Springs, which is five miles from the North Entrance. Starting next Tuesday, December 22, the East Entrance will be open. The road from the North Entrance to the Northeast Entrance is open year-round to wheeled vehicles, meaning the roads are plowed. Still, you might be wise to use all-season tires or carry chains. If you’d like to read about my winter experiences in the park as well as about the wolf-watching trip taken by my friend Rita Reining last year and excerpts from a historical account of skiing through the park long ago, select “Winter” from this website’s “Categories” box.